I just bought a house. Awww, thanks for the congratulations. Anyway, while I would describe the home as “move in ready”, there are a fair number of things that need to be updated or fixed. The crawl space had mold and the sellers remediated that, but the cold air return is pulling from said crawl space (so of course that needs to be fixed). The drive way and front walk way are sad broken concrete vestiges of their former glory. We have what amounts to a mini-forrest on our lot. Lots and lots of mature trees, but 6 are dead and need to be removed. Three of those trees are in precarious places close to houses and other structures. The A/C unit is older than dirt. Etc. ad infinitum. The roof needed a fair amount of work as well. Not because the roof structure or the shingles needed fixing, not at all. The problem was there was too little insulation in the house. I could tell when, during the home inspection on a cold day where a dusting of snow had fallen, that the neighbors’ roofs maintained the white of freshly fallen snow while my soon to be house had dark and wet shingles from the melted snow, proving to me that heat from the house was escaping through the attic and melting what little had accumulated on the roof. So OK, more insulation. Additionally it was made clear during the inspection that the attic had been treated for moisture before, so some past owner had treated the symptom, but not addressed the root cause; lack of venting. I plan on staying in this house for the long haul, so things need to be done on the “up-and-up”, keeping things in proper working order is paramount. We have a rough five-year plan for things that need to be fixed and updated (like the driveway). However, potential moisture issues combined with the immediate benefit of utility bill savings made addressing the roof a priority for us. On upper level rear, remove 3 box vents and redeck holes before reshingling areas. Cut in and install 38′ of ShingleVent II ridge vent and new cap shingles. Seal repairs as needed and remove any debris from site. On upper level eaves, remove all 10 soffit vents and cut openings larger to install 10 new 8″x16″ soffit vents. White. On upper rear slope cut in and install two 4″ Broan damper vents and locate over bathroom fans. Inside attic space replace existing flex-duct with new insulated flex-duct. At current wall vents tape over openings. On lower level garage roof remove 2 box vents to redeck and reshingle openings. Cut in and install 21′ of ShingleVent II ridge vent and new cap shingles. Remove all 6 soffit vents on garage eaves to cut openings larger before installing new, white, 8″x16″ soffit vents. Over garage where lower roof intersects upper level wall, cut all siding off of roof line 5″ to install new Z-metal and new pre-primed 1×4 trim to ensure 1″ off clearance from roof. Paint new trim and Z-metal to match as close as is possible. Since I was mostly just curios about the gutters and the repairs / improvements were what was pressing, we decided to nix the gutters entirely. Additionally, I figured if I was going to add insulation, I was going to ADD insulation, and chose the R-60 solution. While the repairs were listed as options, I didn’t see much option in picking one but not another. They all needed to be done. I figured given the fact that the crew was going to be on the roof anyway they could clean the gutters while there and so I asked for all four options, plus R-60 insulation for a total $5,846 and gutter cleaning for free. After some emails back and forth we agreed on the former work (including gutter cleaning) at that price and was told that a member of the work crew would contact me in about a week-and-a-half to schedule a day / time to show up and do the work. 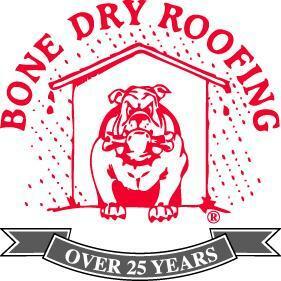 After waiting two-and-a-half weeks with no contact, I emailed Bone Dry Roofing back on April 13th, asking when I should expect someone to reach out. While I didn’t get a response directly, I received two calls the next day on the 14th. One call was from the work crew, scheduling for the 16th at 9:00AM and the second call was from the individual responsible for the insulation part of the project asking if he could show on the 15th to do the work. This actually threw me for a bit of a curve because I felt like he was asking more than my availability but to approve that the insulation work get done before the roof work. I assumed it wouldn’t matter because why else would he call to schedule his work first, but I still was a little uncertain if I should have agreed to him coming on the 15th ahead of the roofing crew. The next morning, the day he was to arrive (we negotiated between 12:00PM – 1:00PM) I realized that ‘option 3’ of the work probably required attic access, and so I called him and mentioned it. He felt like it wouldn’t be a big deal and assured me it would be fine, but I could’t imagine how filling the attic with insulation was going to make working on the vents any easier. Once the Bone Dry insulation guy showed up and started looking around, I think he understood what I was saying about the bathroom vents. He recommended that rather than pursuing ‘option 3’ as detailed, he would just replace the vent lines (which were un-insulated) with insulated lines and save me $400. Then he could complete the insulation job and not affect anything else the work crew would do the next day. Well, I’m not saying “no” to a working solution that saves money, so he proceeded with that course of action. Notice how much of the vertical vent on the right-hand side can be seen. Three rows of wall insulation in the background visible. The pipe is now barely visible. Only one-and-a-half rows of wall insulation peeking above the sea of pink. Above the vaulted ceiling of the master bedroom. This is what it looks like behind the three rows of wall insulation above. I couldn’t walk out there to get a closer shot, but this zoom in provides a comparable “after” view. The space from the Soffit, allowing airflow into the attic. Bumpers from the soffits so that airflow can get through all the new insulation. The next day the Bone Dry Roofing work crew showed up to complete the repairs / venting improvements. When they first showed up they verified the work they were to perform, and I mentioned that ‘Option 3’ was off the table as it had been taken care of the day before. However, after several hours of them working I realized they hadn’t mentioned the gutter cleaning so I brought it up. The response was that the gutters weren’t on the work order, they hadn’t heard anything about it. Besides, according to them the gutters looked pretty good, so no need. Still, “they looked pretty good” is not the same as “make sure they are clean”, and it was something previously agreed to. I don’t have a ladder that will reach the 2nd story roof, so I can’t verify how good the gutters look or clean them myself. I do know that rain just pours right off of at least one corner of the roof indicating an issue. Additionally, after cutting back the siding where the outside wall meets the roof of the garage, the crew discovered the existing flashing was for crap and it needed to be done right (something I actually suspected given how close the siding had been to the roof). So that was an additional $300 to install, but given my $400 savings from the day before, I figured it was a good trade. Garage roof. View of static vents, no ridge venting. Static vents removed. Roof repaired and shingles re-applied. Ridge vent on the right. Where the garage roof meets the side of the house. The siding was too close to the roof, soaking up water and getting damaged rather than letting water run down the flashing. Proper flashing added with a kick at the end to force water into the gutter. Overall I am glad I got the work done and that Bone Dry Roofing performed the work. Of some issue is that both repair and insulation crews were one-and-a-half hours later than agreed to. I didn’t think the email communication after I agreed to the work was very clear as I still don’t know if the crews called me because I asked where we were in the process or if that was coincidental timing (I vote for the former but who really knows). The repair crew didn’t know anything about the gutter cleaning and didn’t do it once it was brought up. I felt like I was being asked for my roofing expertise (I have none in case you wondered) as it related to when the insulation should be done vs. the repairs. We managed to get through most of those things but I could see how in some situations this could have become an issue for some projects. So I would say Bone Dry Roofing needs to work on their communication with customers. As stated, I don’t know construction / roofing work. I like to think I’m a fairly intelligent guy that can “common sense my way through” these scenarios. While I don’t have any real experience for grading the work performed or the cost of the work, I will say that based on conversations with the home inspector and what little I do know, that the work performed was done well. As to cost, I didn’t shop around. But based on some Internet searches I don’t think the costs were out of line (you tell me, you saw the quote). Pricing is a bit of a SWAG for me. I don’t know roofing / construction prices. While I don’t think I got robbed, I don’t have a real way of verifying how great or not so great the pricing is. Performance is the quality of work / did they do what they said they would do. Communication is a rating of how informed I felt at any given point in the process. Likelihood to recommend is how likely I would be to tell someone else they should use Bone Dry Roofing.